Beautiful early evening down here in NoVA - clear skies and temperatures around 60 earlier - in the high 50s now. Very stable skies - slight boiling from time to time. the crescent Moon was truly impressive through the Cave 12.5"! M42 was odd...the nebula revealed beautiful shading, but the Trapezium stars looked blurry...as though behind very thin cirrus... Since we're close to National Airport, wonder if I was looking through contrail remnants? Only this Takahashi has ever done that for me. And only that night. It was a perfect combination of perfect optics and perfect seeing! I believe you. And, I believe Charles. And, I believe what I see with my own eyes. Dawned on me that my seeing reports can be related to maximum magnification per inch. That is, on what I call an 8 / 10 night, 80x / inch delivers sharp planetary views (with a quality scope). Perfect 10 / 10 nights support 100x / inch. IF we ever get some clear nights, I'm gonna see if that holds for 7 / 10 & below... It'll be less subjective than my current system: what's the faintest star I can see, how bad is the sky glow toward downtown, does the Moon have a halo / "corona", etc. Clouds just chased me indoors, but not before I managed 80 precious minutes with two very fine 3" refractors. Short & Sweet Summary: Vixen = brighter views at all magnifications with 0 false color. But overall, no difference in resolution between the two at any magnification from 30x to 240x. Seeing = 8+ / 10, as I got sharp views in both at 80x per inch. Gear: Goto .965" prism + spectros eyepieces in the Royal; Baader 1.25" prism + spectros / UO HD ORs / TV eyepieces in the Vixen. Man! So glad I bought that used TV Radian 4mm! Cruising over the lunar surface at 160x with the FL80S -- bright, razor-sharp, with jet black shadows -- could make even a grumpy old observer happy. Can't wait to view Mars / Jupiter / Saturn at 300x (low speed!) in my APM 152ED! The Moon: Absolutely no CA at the limb, but I did see a very slight yellowing starting at 160x in the 55 year old Royal achro, and it definitely dimmed the views at 240x. The Vixen showed whites and a zillion shades of gray. Shadows were blacker in the Vixen. Cirrus chased me east to Castor -- clean split in both at 40x. Ah... brilliant & colorful in the fluorite, but steadier in the Royal. 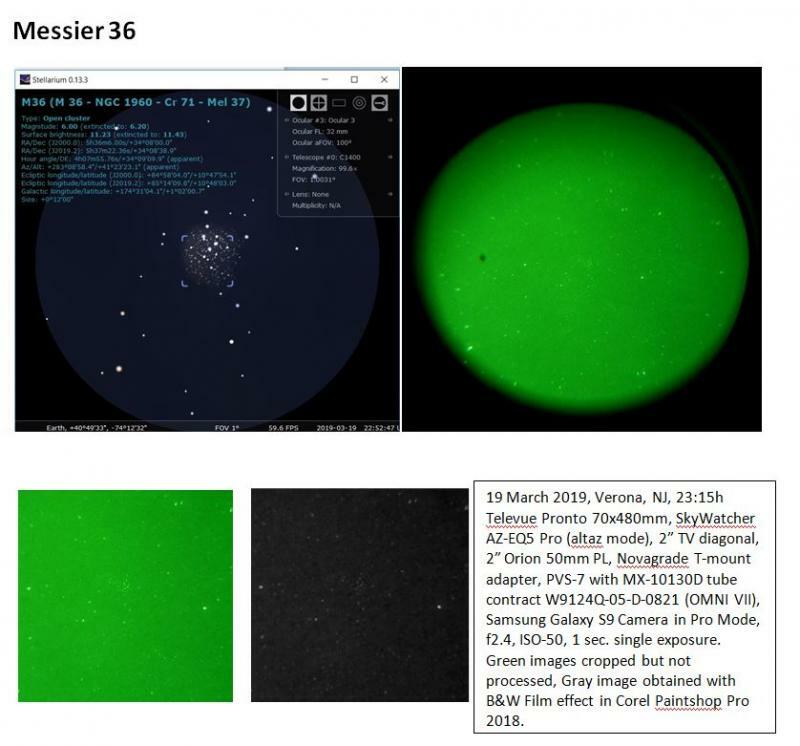 Both fracs showed the same faint stars in the field. I've made lots of improvements to the Royal -- none to the Vixen. Would a newbie with one of these ubiquitous 76mm F15s get the same results? I don't think so -- especially if they had only the bundled accessories. The Goto 106 EQ is rare -- too bad! It carries a Royal 76 like it's a Towa 50mm. The Mizar AR-1 was sold by Orion, Kenko, and others. It's pretty darn good, but would need a taller tripod to carry a long frac. I will add an AstroMaster 9V battery drive to it -- will be great if I can include an on/off lever. Manual tracking with these mounts is smooth enough for a 3" frac's max magnification. Edited by Bomber Bob, 12 March 2019 - 08:27 PM. I had the Unitron 5 inch, f/16 out last evening mounted on a Losmandy G-11 with Gemini 2. Since last observing with the 5 inch I added the 12 inch pier extension and stripped the scope to the bare necessities...i.e. the 10x40 viewfinder only. The G-11 is a perfect "replacement" mount for the massive OTA...and the 24 inch spread on the tube rings ensures a very stable and easy to balance unit. Note: The first photo is of the scope in an earlier configuration...and I added a photo comparing the 5 inch and 4 inch Unitron OTA's. For those thinking the 4 inch is large...the 5 inch is a monster! Sky conditions were above average at the start of the evening and the Moon and M42 were my primary targets. After a rough polar alignment, the Gemini 2 took me right to the Moon...and later Mars, Uranus, M42...and a variety of open star clusters (Double Cluster, M44, M67, M46, M47, M48, M50). I live in a very light polluted neighborhood and I was using brighter DSO's to check out the Gemini 2 as well as the scope. I started off with a University Optics 55mm Plossl (36x) and ultimately checked out a 48mm Brandon (42x), a 22mm TV Panoptic (91x) and a 6mm TV Ethos (333x). The lunar views, including those at maximum magnification, were awesome...very clear and crisp features and shadowing. The viewing of the Orion Nebula was equally awesome through the 22mm Panoptic with nebulosity filling the field of view. It's always great to get the 5 inch out...enjoy it as much as my Brandon 94 and Stellarvue SV110ED! Looked at the Moon, M41, M42, and M45 last night with my girlfriend's 2080. The EXOS-2 mount doesn't love being put on a soft grassy surface and tends to wobble a lot more than if on hard ground or pavement - focusing and tracking at high power is a bit difficult. I had my new-to-me Royal Astro 40/500mm scope out for just a few minutes. There was enough time to view the Moon, Castor and Algeiba. The Moon was exceptional with no false color in any amount and the contrast was equally good. The shortest f/l eyepiece I had out with me was a 6mm Unitron ortho at 83x and it could easily taken more magnification. Castor is not a real difficult challenge even for a 40mm scope, but the Royal Astro put up the best views I've ever seen in a scope of that size. Again, at 83x, you could drive a truck through the separation, which was jet black. Each star had a faint diffraction ring. Algieba was a similar experience. The colors were more toward the orange than Castor and the gap was not quite as wide, as you would expect. Also, I had a minute to view the Trapizium through some free branches. Surprisingly, I could make out four stars, which is a challenge with a 1.6" telescope. Hopefully, I'll get some more clear nights and more time under the stars with this little scope. Tried the Tak out on the Twilight I for the first time. Moon is fantastic with this scope. Unfortunately there are high clouds so I can't look at anything else. Had my Takahashi FS-102 out the other night, along with my Tinsley 4 inch and Brandon 3 inch F/15 refractors for a peek at Castor. Yes, the Tak threw up lovely Airy disks at 200 power, but the two achromats were pretty darn close! At 187 power, the Tinsley 4 inch displayed hard, round airy disks with a hint of a first diffraction ring, indicative of near-perfect spherical correction. Castor was breathtaking, even if the components were not quite as snowy-white as they were in the Takahashi. And darned if the 3 inch Brandon wasn't nipping at the heels of its larger companions! I was taken aback at how hard and round the airy disks were at 187 power. And with its reduced chromatic aberration due to its large air-space objective design, the image nearly matched that of the 4 inch Tinsley. Sixty power per inch of aperture is nothing in this superb achromat! I feel sorry for observers who have never had the chance to look through a top-tier achromat. Yes, they run out of power more quickly than a similarly sized apo (if the apo is of good quality) and contrast can suffer due to the greater chromatic aberration inherent in the crown and flint design, but at the magnifications my suburban skies usually permit, the images in my achros are quite satisfying! Had some of the best lunar views of my life tonight with the Tak. I went up to 400x without a hitch but the best view was at 200x and 120x. Tonight I drove out to the observatory of the Salt Lake Astronomical Society, about a half-hour drive away from me, located in the Tooele valley south of the southern shore of the Great Salt Lake. Housed there is a 16-inch Ealing Cassegrain, an 8" Brandt refractor, and a club-built 32" Cassegrain on a go-to Springfield mount. 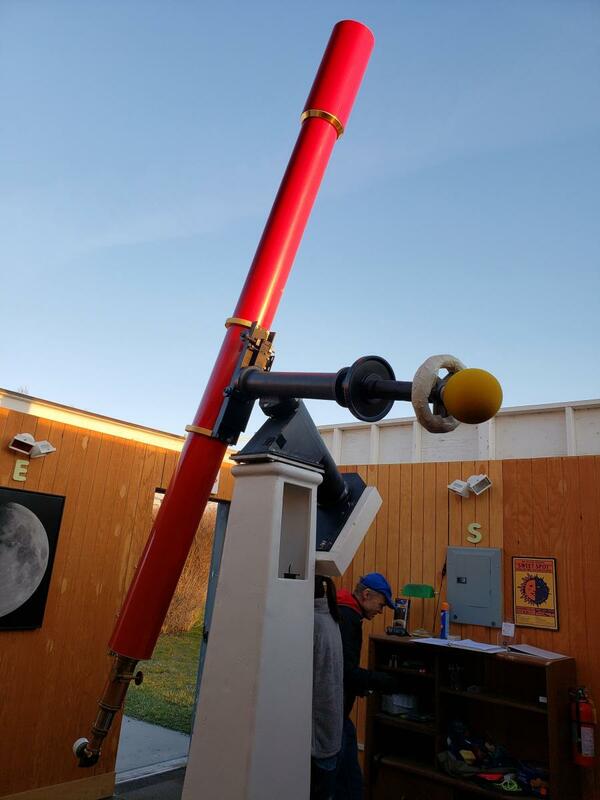 Mike Clement's mamoth 70" Dobsonian is housed there as well, by special arrangement. Tonight I was getting my yearly refresher on the scope, it's required for everyone. We really only looked at the moon since we all had to leave before it got truly dark, but the moon was amazing in a clear, blue sky for a change. The Brandt is a wonderful scope built by Patrick Wiggins, discoverer of supernova and several minor planets. He also generously donated the instrument to the club in honor of his late mother. We have known each other since at least 1975. I was also fortunate to have him as the instructor tonight. With only one other student, a young woman from the club, he could take his time for her to make sure she got the hang of it. 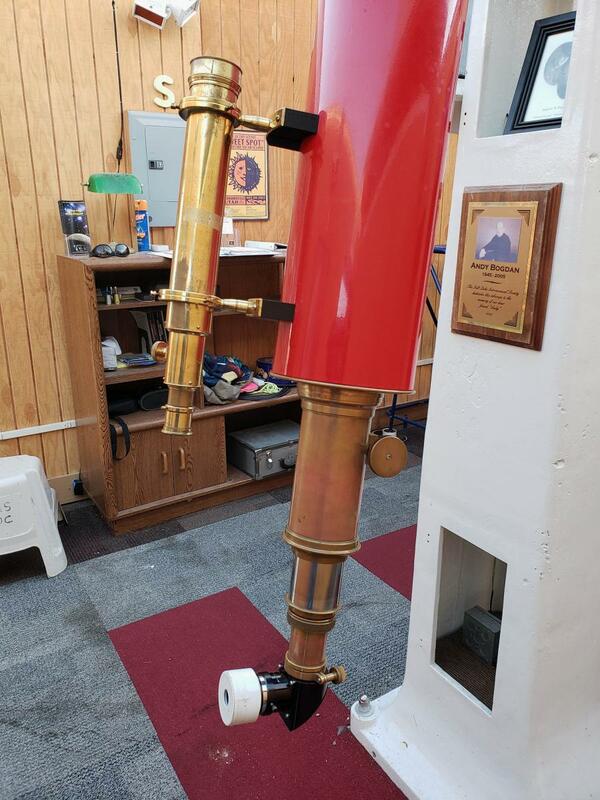 She had no other telescope experience, imagine learning on this big 8" refractor as your first! Patrick used to drive this scope around on a trailer, to set up at star parties around the region. It uses many genuine antique telescope parts in it's execution. I believe that the cast-iron pier it is mounted on is one that originally sat outdoors, when the club had individual observation pads and piers. It was owned by Ziggy and the story goes that it's a Unitron. Somebody here surely recognizes the maker. 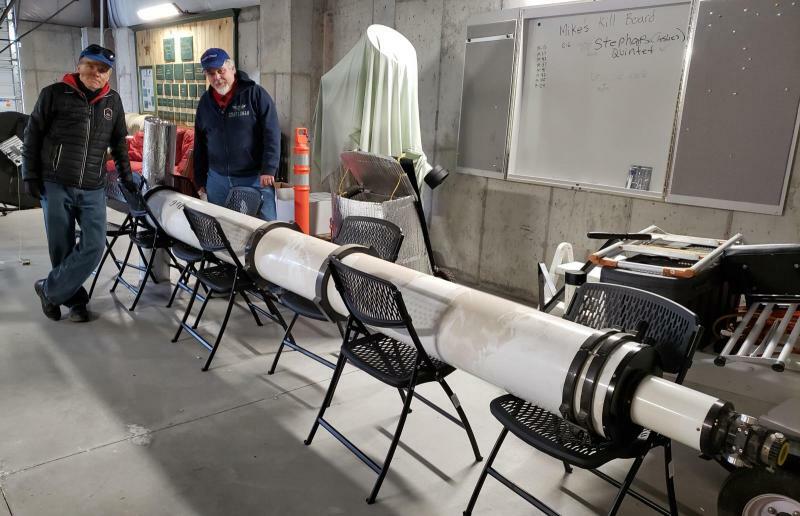 Ziggy was the one driving force behind the creation and ongoing endowment for this jewel of an outreach-oriented observatory, without his efforts it might not exist at all today, or at most be a shadow of it's present importance to the community. 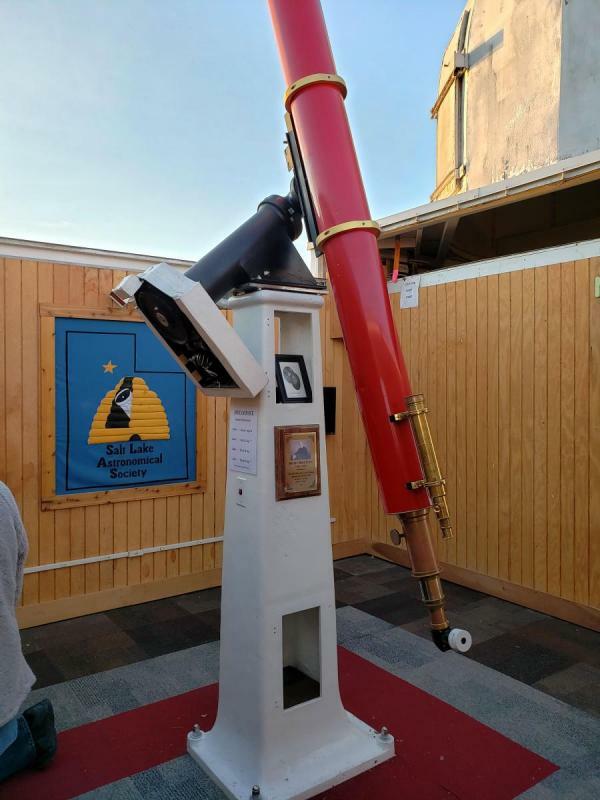 Qualified operators can reserve the scopes for their own use on non-scheduled public star party nights, by blocking-out nights on the club calendar. While there, Patrick showed me the OTA of the 11" D&G refractor that was recently donated to the club. I have to say, this one really made my heart skip a beat. It makes a 6" f/15 refractor look like nothing special at all, in comparison. I feel like I need to wear a Percival Lowell outfit just to look through it. I can't wait to see it mounted again. This is inside the building that houses the 70", which is just beyond us to the left rear. I'm happy to finally see spring start to get a toe-hold, and with any luck I can spend more time out there this year. The sky is best there right about this time of year. I've seen NGC 7000 clearly, like a photograph, from there about ten years ago. A friend was with me and saw it too, we both were a bit amazed. Or a 100mm with two Leprechauns near it! My son and family lives in SLC. Nice area. Edited by Joe1950, 18 March 2019 - 01:59 AM. Seems like it has been yeeeears. Finally my schedule coincided with a few minutes of clear sky. C102F and a few old binoculars were out to get a look at the moon, Pleiades, Orion, and a few constellations that I have yet to identify. Not the best seeing, but I also had a bit of time with Jupiter. Went up to 100+ power. Best image was with Meade 7mm RG ortho. I hate to say it, but I am getting tired of the cold. Looking forward to sweating a little while I sit still. I got out for a few minutes for one last look with the C130 Maksutov. Mainly observed the moon. A few craterlets in Plato were visible despite the less than average seeing conditions. Best views were with a 7mm Nagler at 285x. Mars was a little orange ball flickering through the atmosphere. Rolo, you reminded me. I actually looked at Mars a little bit the other night too. I tried going with a 3.5mm ep, but bleah. 7mm was a nice round little ball, with a hint of the polar caps...if that's possible. I convinced myself of it anyway. Glad to see your report, Rolo! While the skies are finally clearing up, I still can’t get out and observe. The smoke from the chemical fire in Houston has the sky a weird color and I’d rather not subject my optics to that. This was supposed to be my couple of clear nights window before the rain starts again on Saturday. Curses. Not to mention all the green stuff. Don’t you just love spring. Perfect DSO seeing tonight, so naturally there's a waxing near-full Moon... Both of my Vixens -- FL80S & VMC200L -- got some deep sky time before the glow swept west. The 8" CAT makes every cluster rich as Croesus. Hope I can get in a SxS between it & my RV-6 -- see if 2" extra aperture gives better views than a reflector that acts like a refractor. but upon reflection I should have moved to the lawn 8 feet away. You think it is so quick an easy and rut row I Dropped an eyepiece for the first time in years...... it ended badly ..... somehow I thought I placed it carefully on the back of the car behind me But on the slanted stern of the Datsun 280z it fell on its side it rolled down and picked up speed with Earth's gravity and I missed the save as it hit the concrete where it meets the asphalt ......... asphalt my fault . Consolation Not one of my best eyepieces as it was a well used Stellavue plossel 9mm that came with some purchase but it was a shattering experience I must learn from....Where was my Yoga matt that usually protects me from myself? So, I had a 3-frac SideBySideBySide: Vixen FL80S / 5" F5 Triplet / 4" F5 Jaegers. The first two are close in focal length. I set about 40x on all 3, and started by comparing star colors. The Vixen fluorite is my reference scope -- it and my Tak 50mm have the most natural colors of all my fracs. Capella: a bit more orange in the 5" vs. a bit of red in the 4" Jaegers. Sirius: almost identical in the 5" vs. some violet in the Jaegers. Overall, colors in the 5" triplet are closer to the fluorite than the 4" Jaegers -- at the center of the field. The Jaegers has a flatter field edge to edge -- nothing like the triplet's distortion. Edited by Bomber Bob, 21 March 2019 - 05:59 AM. One thing I learnt is that chunky 2" eyepieces like my Orion 50mm PL, or the Orion/UO 32mm ER, have a lot of thermal inertia and when you carry them back after hours in the cold, the fingers begin to hurt very quickly! Edited by DMala, 20 March 2019 - 11:43 PM. My Criterion RV-6 Dynascope is going on 50 years old, but I sure couldn't tell it tonight. The air was a lot calmer (and less clear) than the previous two nights. Mars is just 4.8" wide, yet at 200x I had no problem seeing Syrtis Major, and in brief moments (5 to 30 seconds), Utopia popped into view as a tiny dusky belt. BIF: The Martian disk was an unusual color in the Dynascope -- pale yellow + tangerine + salmon. Syrtis wasn't pure black -- had some gray & brown mixed into the shark's tooth. Star clusters weren't as striking, but I guess you can't have everything. I hope that the NWS is right, and I can put the RV-6 up against my Vixen VMC200L tomorrow night, when I don't have to worry about getting up and going to work. M41's central star... almost a candy-apple red versus a darker the FL80S. Edited by Bomber Bob, 22 March 2019 - 08:51 AM. Just got in from doing some white light solar observing with the 6" F/8 newtonian. There's a nice cluster of spots on the western edge that is about to rotate out of view. Indeed !! Its a beautiful Group !! Before the moon-glow, seeing tonight favored DSOs -- clear & active -- at about a 7/10. The 8" Field Mak-Cass trounced the 6" Newt on every object type except double stars. Here, the refractor-like Dynascope, with it's pinpoint stars against a black background, made for prettier pairs. The highlight was the Eskimo Nebula (NGC 2392). Its nature was obvious in both scopes at just 60x. At 100x, it remained a pale gray in the Newt, while the CAT showed a green-gray outer lobe and a brighter & bluer inner lobe. I could see some internal structure at 285x in the Vixen using the Nagler 7mm. Both scopes have 50mm finders, but the Vixen is straight-through -- a real pain in the neck. I put a vintage Nihon-Seiko RACI on the Dynascope. Not only is it much more comfortable, the N-S is optically superior, too. M35 & M37 were small fuzzy patches in it -- neither showed in the Vixen. If I wake up early enough tomorrow & the seeing is good, I'll check out Jupiter in both scopes. 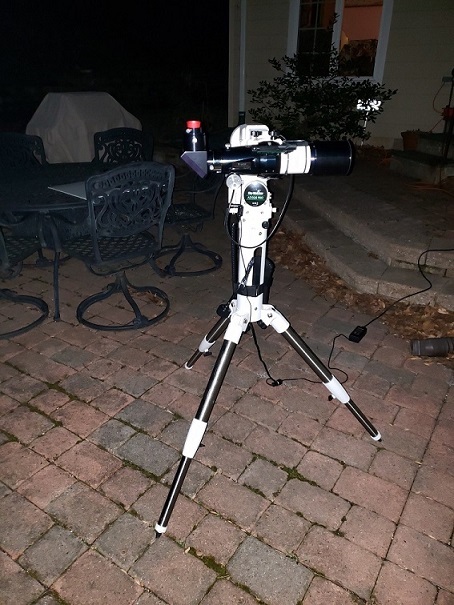 I woke up just before 0400, and that was a good thing, as I had maybe 15 minutes to start the coffee, and get the two scopes set up at the north end of my back yard before Jupiter cleared the last treetop. I put them as close together as I could without tripping over them. Saw a faint glow around the waning Moon, and I traced thin faint cloud belts running west to east -- made Antares change colors with their varying thickness. Not good. I set both at 100x, centered Jupiter, and turned on the drives. In these conditions, the RV-6 was easier to focus. The VMC reminded me of my APOs -- took more time & effort to find that sweet spot. At times the smog belts shifted south and out of the field, and I got crystal-clear views. I saw only 3 Galileans in both 50mm finders. In the RV-6, all 4 were sharp & bright, and Europa & Io were almost on top of each other. Jupiter was too bright in the VMC at 100x, so I went to 200x in both scopes. Gotta give the win to the VMC: Belt colors were bolder & brighter, and I could see part of a white oval on the limb that I couldn't see at all in the RV-6. The RV-6 maxed-out at 240x with the spectros PL5; or, 40x per inch. The VMC was sharp at 333x with the UO HD OR6, and gave up just a bit at 400x with the same PL5. I have no doubt that in better seeing, the VMC can deliver at 50x per inch. Big Questions for BB: Can the VMC200L replace my APM 152ED? Nope! The Big APO delivers at 80x per inch; and, can go from 15x wide-field to 400x planetary. The VMC is a fine substitute scope for short sessions (takes < 5 mins to set up), and is better for the faint fuzzies than the 6" refractor. Does the VMC replace my RV-6? Nope! 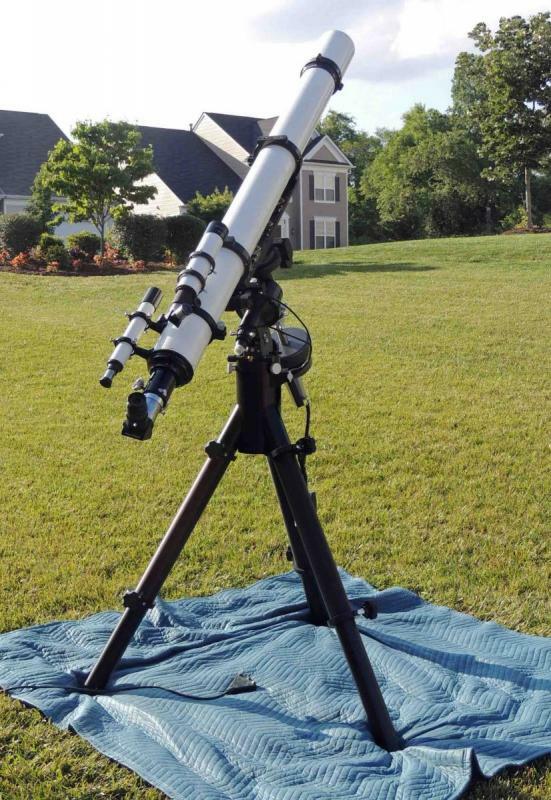 The RV-6 is even easier to deal with logistically, and is always refractor sharp. Edited by Bomber Bob, 23 March 2019 - 06:27 AM.